Between releasing an early teaser image and sharing the secrets of its pre-production camouflage, Chevrolet has been pretty forthcoming when it comes to its next-generation Volt extended range EV. 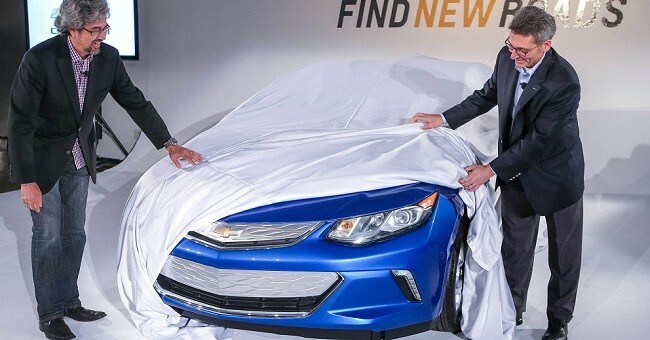 This morning they got even more forthright with us, tweeting out a picture of the Volt’s front fascia peeking form beneath a white sheet with the words “We just want to be up front with you,” attached. The teaser image above is from a preview event held last night in LA for current Volt owners, who were apparently shown the entire car. To our eye, the 2016 Volt is shaping up to be rather handsome. It looks as if someone took a scalpel to a current-generation Volt, slicing away the unnecessary bits until they were left with a sharper, more chiseled front-end. A poster from GM-Volt.com attended the preview party, where he and others were taken into a separate room, had their cameras locked away and were shown the full car. A non-disclosure agreement was signed, so no information can be divulged, but he says the car “looks fantastic,” with “modern and aggressive styling,” which is reminiscent of the current Impala and Corvette. In addition to giving select customers an early look at the car, Chevrolet also announced a new GPS-based charging system for the next-gen Volt. The system allows users to put different charging settings in place for different charging stations. For example, if the Volt is charging at home, it may be set to its full charging amperage to take advantage of off-peak power rates. The car will know when its at home, or at a public station, and adjust the charge settings accordingly. The 2016 Volt will use a 1.5-liter four-cylinder gasoline generator, which will improve its range and contribute to it being more efficient than the current model. Little else is known about the new EREV, however we’ll have the full run down when it makes its debut at the North American International Auto Show in January. Previous story Chevrolet Chaparral 2X Vision Gran Turismo Concept: Hot or Not? Is that a 2012 Honda Civic Si Coupe they’re unveiling there??? Looks way better than the current Volt! January cant get here quick enough. Chevy needs to upgrade design. Much of the current line up its needlessly frumpy. Kia, Mazda and Chrysler prove value can be stylish, too.